Pink Mist is a story of three Bristol lads (Arthur, Hads and Taff) whose decision to sign on the dotted line to become soldiers in Afghanistan takes us through a familiar coming of age tale, enlightened by the real-life stories from those on the front lines of modern war. It is told through the intimate insights from not only the boys themselves, but through the eyes of those closest to them, Arthur’s girlfriend Gwen, Taff’s young wife Lisa and Hads’ mother. 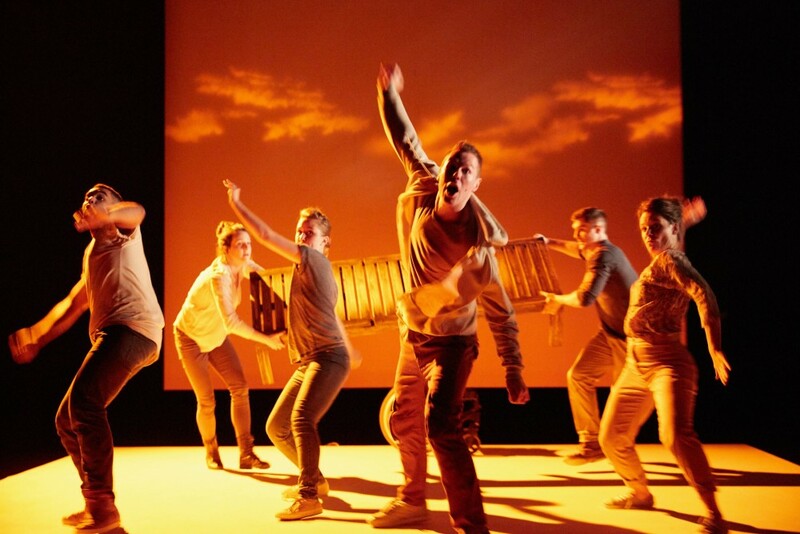 Having been adapted from its original novel by Owen Sheers to a BBC radio play, it is now in its third form as a BOV stage performance directed by John Retallack. Sheer’s script is a beautiful work of modern poetry which brings the horrors of war, and more importantly, the horrific aftermath of war, out from the headlines and news reports we are so desensitised to and re-establishes them as an intrinsic, life-shattering aspect of contemporary life. The script is a work of art in itself which stands alone in its masterfully poetic structuring. The rhythms of the dialogue are a musicality the six actors – who are all on stage throughout the play – clearly understand. Each line and every intonation are delivered with rhythmic precision. The almost bare stage boasts only five props, a wheelchair, three helmets and a bench with no scenery to speak of, yet these actors capture the mood and atmosphere of war zones, Camp Bastion, well-known local landmarks (Thekla, V-Shed, Avon Gorge, Clifton Suspension Bridge and Dundry Hill) and various domestic settings all through well-honed and stunning, synchronised movements choreographed by Associate Director, George Mann. One by one the story explores the relationships our three soldiers have with each other as well as their respective loved ones, pre and post conflict zone. The plot skips back and forth in a non-linear portrayal of the lads’ stories, telling who they were prior to enlisting and who they became through the devastation of the experiences of war. Our protagonist, Arthur, played by Phil Dunster, has a desire to leave Bristol, to see something more. That’s how it was the morning when three of us did what boys always have and left their homes for war / ‘cause that’s what we did, for sure – make no mistake / not going someplace, but leaving somewhere. / Getting out, moving on, away from here. He leaves his broken-hearted girlfriend, Gwen, played by the always likeable Rebecca Hamilton, to put a stop to the mundane life of working at the Portbury Dock. His honourable intentions lead him down a road of guilt and pain as the consequences for leading his friends into a fate he could never have imagined unravel. Dunster’s natural ability for shifting effortlessly between poignancy and humour is astounding; he wears this play as a second skin and owns each and every word spoken. The first of Arthur’s two mates to follow and sign his life over to Queen and Country is Taff, played by Peter Edwards. He is a young father to Tom and husband to Lisa and sees his enlisting as a way to provide for his family. Edwards’ portrays the extremities of PTSD in a subtle and understated manner; which gives his character a profoundly menacing edge while maintaining the qualities one might associate with a boy forced into adulthood before his time. Erin Doherty’s portrayal of Lisa is second to none. Winner of the Stephen Sondheim Society Student Performer of the Year 2015 award, Doherty certainly knows how to make the stage her own, as well as share it with her counterparts. She channels an unspeakable anguish from somewhere deep within, which she controls superbly throughout her monologues and the interactions with her broken husband; wrought with a pain that spreads throughout the audience. It is an incredibly moving, visceral performance that gives the audience chills, scene after scene. This outstanding performance will not soon be forgotten. The third and youngest of our trio, Hads, is brought to life by Alex Stedman. Stedman plays the boyish personality of Hads well, breaking the audience’s heart by the simplest of gestures. 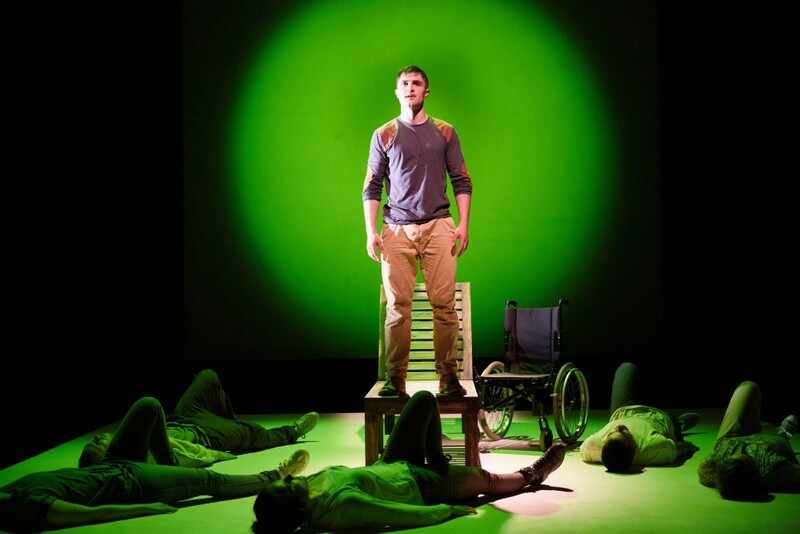 Hads is rendered disabled by his experience of war and the responsibility of his recovery falls into the loving hands of his mother, played by Zara Ramm. From TV and film, to various stages, she is the most experienced of Pink Mist’s cast so it is not surprising to see how skilfully Ramm epitomises a mother’s grief and personifies truly maternal strength in the face of adversity. The playground chant “Who wants to play war?” of the boys’ Bristolian childhood becomes a reality right in front of us, as does the reality of real-life boys whom, every day, march off to war, many to face the same fate of Arthur, Hads and Taff. While sobering, the play also includes perfectly executed moments of comedic relief that notably help the audience to appreciate the contrasting emotions felt throughout the two hour play. The combination of exceptional performances by the entire cast, the choreography, lighting and sound has created a remarkable experience that stays with its audience far after the numerous standing ovations subside. This ground-breaking piece of theatre is not one to be missed, and will certainly be enjoyed by many audiences in the years to come. 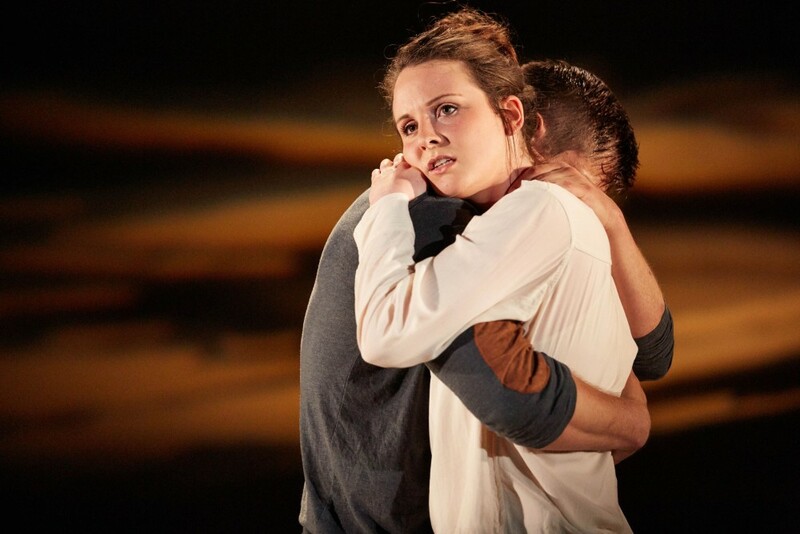 Pink Mist runs 1-11 July, 2015 at Bristol Old Vic. Tagged bristol old vic, pink mist. Bookmark the permalink.